The editorial staff at the Sun and its sister paper New Times are used to answering questions about the paper from curious readers, but Nov. 2 was one of the first times they needed the help of a Russian translator to do it. That morning, the New Times Media Group's publishers, editors, and reporters hosted a delegation of journalists from Russia at the New Times office. The delegation had been traveling around SLO County for the past week, meeting with elected officials, university professors, and local newspapers as part of a leadership exchange program sponsored by the U.S. House of Representatives. 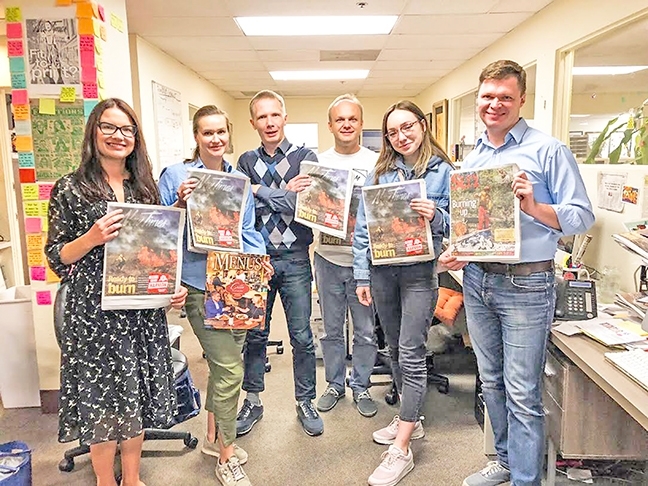 A group of Russian journalists, editors, and journalism professors stopped by the New Times office as part of a weeklong visit to the Central Coast. Pictured left to right: Nataliya Poplavskaya, Yelena Burdovskaya, Konstantin Alekseyev, Pavel Bodrykh, Yevgeniya Potekhina, and Yevgeniy Belyanchikov. "What I thought was interesting was that many of the questions they asked were some of the same questions we get from the population at large here in San Luis Obispo," said Sun Executive Editor Camillia Lanham. Joe Payne, managing editor of the Sun, said he was also struck by how many topics of the conversation mirrored discussions and debates going on within the U.S media. "The Open World Leadership Center administers the first and only international exchange agency in the U.S. legislative branch that is completely controlled by Congress," the organization's website states. "The founders of Open World were united in the belief that widespread, direct contact between American leaders and those of other nations would greatly benefit all involved." • The Lompoc City Council approved a rezone and agreement that will allow the construction of a new, 28,000-square-foot Community Health Centers (CHC) facility along the 1200 block of West Ocean Avenue. The facility will include "49 exam rooms, doctors' offices, a blood draw area, laboratory, imaging room, restrooms, pharmacy, and dental services," a city press release stated. The location will join Lompoc's other CHC facility located at 425 W. Central Ave.
• Marian Regional Medical Center and the Santa Maria Valley Chamber of Commerce will host a Health Care Roundtable on Nov. 9 from 7:30 to 9:30 a.m. at the Marian's Conference Center, 1400 E. Church St., Santa Maria. Community members are invited to attend and hear from Marian's new president and CEO, Sue Andersen; cardiologist Jason Choi, MD; and breast surgeon Monica Rocco, MD, FACS. There will also be a Q-and-A session as well as a complimentary breakfast. More info: marianfoundationfeedback@dignityhealth.org. Chris McGuinness, staff writer for the Sun's sister paper New Times, wrote this week's Biz Spotlight. 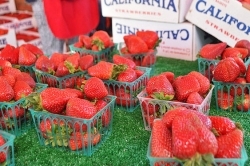 Information should be sent to the Sun via fax, mail, or email at spotlight@santamariasun.com.